There have been many times on Kinder Scout when I have experienced a wonderful sense of walking in the footsteps of our ancestors and all the history that has come to pass in the Peak District hills. I had found the remnants of a bothy like structure on the slopes of Kinder a while ago. One of my neighbours, Dave, who's family has lived in Hayfield for many years, recalled the story of The Shooters Refrectory over a cup of tea. 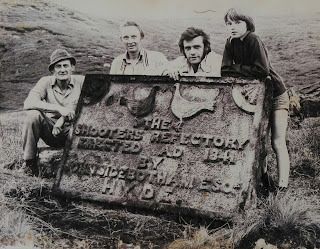 Indeed we spend quite a lot of time chatting about Hayfield history over a cuppa or tinny of cider. The Shooters Refectory (also known as Sidebothams Cabin) was demolished in 1938 as it had fallen out of use by the estate. This was a time when public access was far more restricted than it is today and so its destruction deterred folks from using it as a impromptu bothy. The cabin was built so strongly it had to be blown up with dynamite. Before the explosives were placed, the carved stone was slid down from its place in the gable end on the roof beams. It was supposed to go to Abney Hall in Cheadle, but it never did and remains where it lies to this day. The last private owner of Abney Hall was Sir James Watts. The Watts family were major landowners in the High Peak. 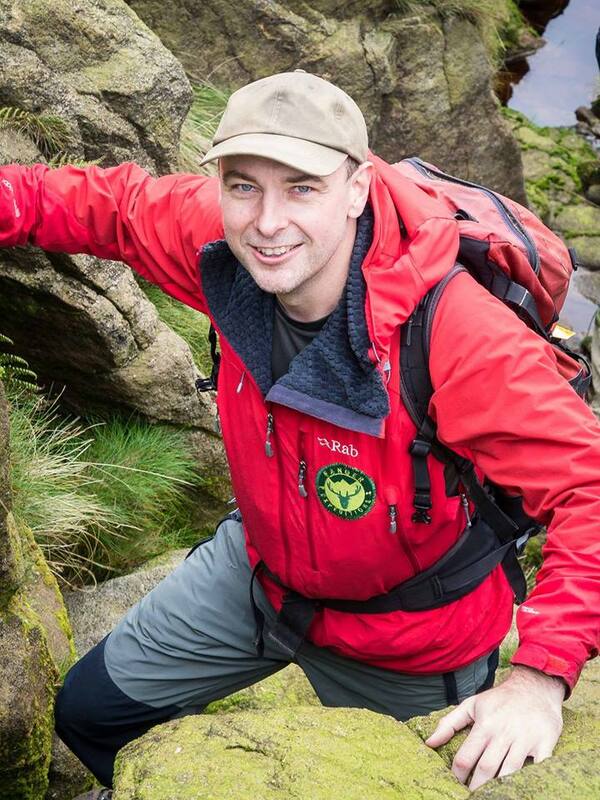 He held property in the village of Hayfield as well as large areas of moorland around Kinder Scout for the purposes of hunting, shooting and fishing. Sir James' grandson (also called James Watts) was Agatha Christie's brother in law; James having married Agatha's sister Margaret in 1902. Agatha spent time at Abney Hall as well as the original 18th Century gamekeepers cottage - Farlands House and Upper House Farm in Hayfield. She is known to have written several of her books in these places and used the locations as inspiration for her writing. 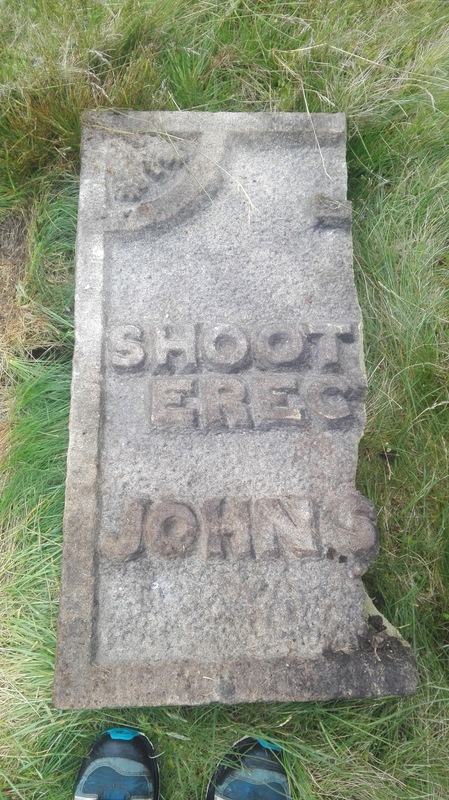 The stone was placed face down a few metres away from the demolished cabin, the inscriptions protected from the elements. It's a extremely heavy slab of sandstone, its weight has kept it undisturbed for decades.Sometime in the past couple of months the stone has been broken into two pieces. This could possibly have been due to frost cracking, but more likely as a result of some rough handling by person(s) attempting to see the inscriptions. So what for the future of this significant item of historic importance to Hayfield and The Peak District. The priority must now be for the stone to be stabilised and preserved without further deterioration. This is a job for a conservation work party under the supervision of the National Trust landowner. However, the plan of works need not cost significant sums. The stone could be relocated to a position leaning against the partially remaining section of wall. A qualified and experienced stone mason might be able to brace and repair the stone. Scattered in the rubble of the cabin are stone door jambs. These could be re-purposed, without destroying them, to improvise a lintel over the stone this protecting the inscriptions from the elements. Allowing them to be seen and appreciated by generations to come. Thanks for sharing this (on Facebook). The National Trust are aware of this unfortunate news that the stone is now split. we are intending to recover the stone. We've read your link, of you have any concerns please do get in touch. Thank you for sharing the impressive photograph of the complete stone. Thanks for showing this, it evokes fond memories. Alan Sherwood was my father. Affectionately known as 'Angus' he worked at Kinder Reservoir Water Treatment Works and lived at the Lodge. 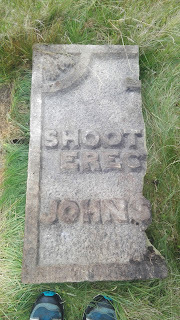 I remember when he, Evan and Robin first uncovered the stone - it was a well kept 'secret' for many years - so sad that it is now broken.